First Round : Lon Hinkle and Jim Simons shot five-under par 67s and led by one over Hale Irwin and Dave Barr. Second Round : Irwin added a 68 for an eight-under par 136. He led by four over Barr, Nick Price and Bill Kratzert. Third Round : Wadkins played the last five holes in four-under par for a 67 on the round and an eight-under par 208. He led by one over Irwin. Missed Cut: Chip Beck (80-76-MC), Woody Blackburn (81-73-MC), Rex Caldwell (75-76 -MC), Ben Crenshaw (73-78-MC), Mike Donald (77-82-MC), Bob Eastwood (73-78-MC), Dave Edwards (73-79-MC), Brad Faxon (81 -74-MC), Ed Fiori (79-74-MC), David Frost (75-79-MC), Bill Glasson (76-76-MC), Mark Hayes (76-78-MC), Gary Koch (79-73-MC), Bruce Lietzke (72-79-MC), Larry Mize (79-76-MC), Mike Nicolette (79-80-MC), Greg Norman (75-76-MC), Chris Perry (73-78-MC), Mark Pfeil (77-75-MC), Don Pooley (78-75-MC), Mike Smith (75-80-MC), Jim Thorpe (75-78-MC) Ron Streck, (78-74-MC), Mike Sullivan (80-73-MC), Bobby Wadkins (78-73-MC), Fuzzy Zoeller (78-74-MC). Weather: Pleasant every day with gusty winds on Thursday and Sunday. What is this, a trend? After eight different champions in the first eight Memorials, Jack Nicklaus repeated in 1984 (first in 1977) and Hale Irwin in 1985 (first in 1983). Of course Irwin's second title acquisition had a whole lot more to do with his heady, steady manipulation of the Muirfield Village Golf Course than any unseen force like a trend. "He very seldom makes a mistake," said Lanny Wadkins, who led the third round, but lost some of his putting magic and came up a stroke short at the finish, 282-281. Twice-U.S. Open Champion Irwin did make some mistakes, but mostly after he'd banked a 4-shot lead at No. 12 of the final round head-to-head duel. "When I had the four-shot lead," he recalled, "I felt if I can just hang on, which I barely did. It wasn't too pretty or too effective on the last few holes. But it worked." 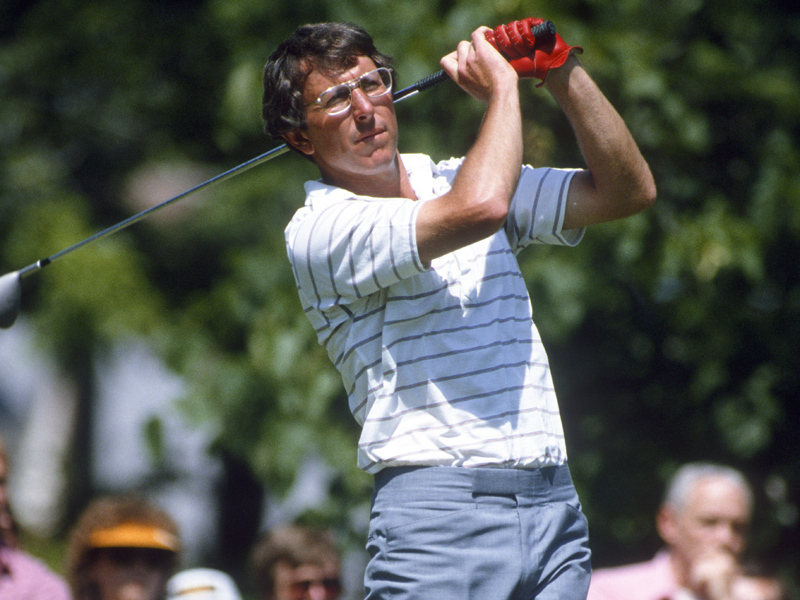 Although his winning total was an identical 7-under-par, Irwin decided, "I played better in '83. But (in 1985)I think I managed what I had better - keeping out of trouble areas. I don't think I played up to my capabilities, but I took what I had and played within my limitations." If he gave his 1983 performance a higher rating, Irwin may have appreciated his 1985 result even more. He hadn't won on the TOUR since the 1984 Bing Crosby Pro-Am, was 62nd on the money list and by his own admission on a down cycle. He partnered Jack Nicklaus in a practice round match on Wednesday and recalled later, "he shot 66 and I didn't help him on a hole. I'm thinking "how in the world am I ever going to get through this week?" What's more, the par on the 36th hole meant a 4 under par 68, exactly matching his opening round, and a whopping four stroke advantage over the field. Misleading, Irwin insisted of the first two rounds. "It wasn't the spectacular shot making you expect when you play bogeyless golf," he said. "I simply managed my misses." The streak came to a halt on No. 8 of the third round when Irwin bunkered his tee shot and two-putted. Gone, too, was his lead as streak player Wadkins sizzled to a 67 - to Irwin's 73. But at the finish, Irwin analyzed his performance and his 17th TOUR victory and credited what some considered conservative, methodical, even unspectacular golf. "On this type of course," he explained, "you have to have the ability to curve the ball right or left, depending on the conditions, you have to know when to hit the driver and when to lay back. You have to know where the mounds are that will pitch your ball toward the target area, not necessarily hitting at the pin but using the slopes to get close to the pin. There are a lot of those places on this course. You have to use common sense many times." Another secret to taming Muirfield, Irwin identified is "one extra-large tablespoon of patience every morning. If you get yourself carried away with birdies or bogeys, you get in a situation of playing "catch-up" and you'll never catch up. I think experience as much as anything won for me and patience comes from experience." With the $100,000 check, Irwin became the leading money-winner of the Memorial Tournament, edging past Nicklaus - and boosted his 1985 TOUR earnings to $150,000. Stockbroker Jim Simons, the 1978 Memorial champion, and Lon Hinkle, a Captains Club sponsors exemption, managed their Muirfield best-ever 67's to lead the first round with Irwin at 68 with Canadian Dave Barr, and Wadkins shared 69 with Tim Simpson, Bill Kratzert and Scott Hoch. Nicklaus, at 71, was one of 19 parbreakers. With a par 72, Wadkins trailed Irwin by five after 36 holes at l41, one behind Nick Price, Barr and Kratzert. In a second windy, though sunny day, only Irwin, Price (67) and Dan Halldorson (69) broke 70. Nos. 16, 17, and 18 gave up 20 birdies, but inflicted 97 bogeys. With Irwin still leading by four on Saturday, Wadkins revved up the galleries with spectacular long-putting. He birdied No. 14 from only six feet, eagled No. 15 from 25 feet, saved par on No. 16 from 30 feet and birdied No. 18 from 25 feet (after hitting it out of a fairway bunker with a 7-iron). He nearly sank birdie bids from 10 and 13 feet earlier. Irwin matched Wadkins' birdie at No. 14, but bogeys at Nos. 13 and 15 cost him the lead, 209-208. Wadkins' total equalled David Graham's 54- hole tournament record, set in 1983. Kratzert was still in range at 211, two ahead of Bill Rogers and Hinkle. Looking to the showdown round, Wadkins suggested, "I can think of a lot of other people I'd rather have one stroke behind me" and it was prophetic. Wadkins bogeyed No. 1, but birdied No. 2, Irwin birdied No. 4, but Wadkins bogeyed, both birdied No. 5 and No. 7, Wadkins bogeyed No. 8 and both lost a stroke at No. 9, Wadkins missing from 18-inches. Despite a bogey at No. 10, Irwin crested the "cushion" with a birdie at No. 12, while Wadkins suffered bogey on both No. 11 and No. 12. The lead shrank when Wadkins birdied No. 15 and Irwin bogeyed No. 16, but the lead was still two - enough to absorb a bogey at No. 18. Incidentally, two "shots" that may have been especially valuable to Irwin do not show in the final total. He proved allergic to the springtime fall-out from the course's cottonwood trees and, after sniffling and sneezing through the third round, had an anti-allergy shot and another one Sunday morning. He blew his nose less and didn't blow his bid for a second Memorial title at all. Third place went to Kratzert at 284, with George Burns, finishing with a 69, pushing up to a fourth-place tie with Keith Fergus and Corey Pavin. Host/tournament founder/defending champion Nicklaus opened with a 71, but joked through obvious disappointment. "I ran out of gas about the seventh hole of the second round and never found a filling station." For another welcome time, sunny, warm, though windy weather favored the Memorial for the entire week, although Pro-Am day (Tuesday) was cloudy until early afternoon.